Small grocery stores see influx of new customer during chain store remodel. Two grocery stores in the El Sereno area of Northeast Los Angeles say they have seen an increase in business since a national chain store shut its doors to undergo a major makeover. Since closing down earlier this year, the Food4Less located at 4910 S. Huntington Dr has been nearly stripped down to its frame, at one point leaving only a shell of its former self; work should be completed by sometime in June. And while some of the retailer’s customers might feel inconvenienced by the closure, for two nearby smaller, yet full service grocery stores, the closing has been good for their bottom lines. The stores are tight-lipped about their sales numbers, but both Big Saver Foods #2 and Fresco Market — located on opposite ends of South Huntington Drive — say they have experienced an increase in sales. Ignacio Burgos, manager of Big Saver Foods #2, located at 5168 S. Huntington Dr., says new customers are walking in the front door. Burgos said some of their new customers have confessed they didn’t even know the market was there, and he anticipates some of them will continue to frequent the store after Food4Less reopens. The store is part of Vernon-based Big Saver Foods, Inc. chain of grocery stores in Southern California. Fresco Market, located at 4617 Huntington Drive, has also seen a gradual increase in sales, according to Manager Shean Beck. He too is hopeful that the market’s new customers will come back once Food4Less’s construction is complete. The market has long competed with Food4Less for business, he said. It was not too long ago that Food4Less would advertise its weekly specials by comparing its prices to Fresco’s, but they stopped the campaign targeted at vegetables prices when they couldn’t beat Fresco’ low prices, Beck said. David Hernandez, the assistant manager at the El Sereno Food4Less, is currently assigned to the Highland Park Food4Less on North Figueroa Street. All 40 of the store’s employees were reassigned to other store locations, he said. When the El Sereno store reopens, it will be “a brand new store, you name it, carniceria, service deli, new everything,” Hernandez told EGP. “It was a really old store … an old mama papa store. 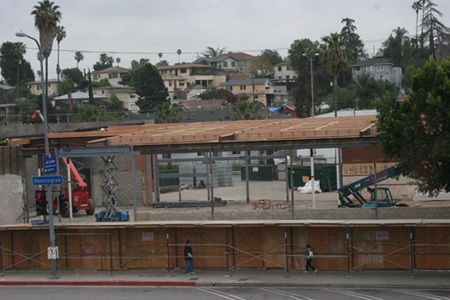 When they’re done, it’s going to look really, really nice … El Sereno is going to be really happy,” Hernandez said. According to Hernandez, the store could reopen around mid June. The El Sereno location was much smaller than other Food4Less warehouse-style stores and did not have either a meat counter or bakery, two features popular with Latino customers. While it’s possible some customers may stay with the smaller grocery stores, one El Sereno resident told EGP he plans to return to Food4Less for most of his shopping. “It’s close, I could walk down here [to Fresco] but as far as the prices, it doesn’t compare,” he said. Before the Food4Less closed, 23-year-old Moses Araiza only shopped at Fresco for fresh meats because Food4Less did not have a meat counter. And while Fresco is closer to his home, he says he prefers Food4Less because it’s cheaper, and has the bulk items his large family needs. Araiza said he might go back to Fresco for the sweetbread. Elizabeth Hsing-Huei Chou contributed to this story. April 5, 2012 Copyright © 2012 Eastern Group Publications, Inc.